Journey is the newest addition to our family. He is an Alsatian Wolf Dog ( European breed name for German Shepherds, which I prefer using). His coat coloring and markings are known as "wolf sable", and indeed he does look a lot like a wolf or a coyote. 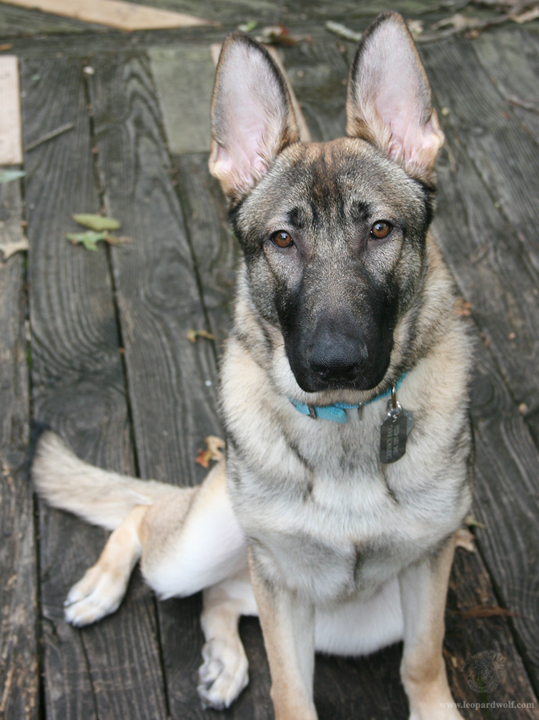 He has European stock lines in his family, which is why he looks different than many American line German Shepherds. He is almost two years old and still has a lot of growing to do. When full grown he will hopefully be over 110lbs. Journey was adopted with the intent of raising and training him to be an assistance dog. He is taking over as Ember's successor now that she has retired. He is my new mobility assist service dog. Journey is an amazing young dog, highly intelligent and eager to learn and interact. He has been an absolute delight to work with since I first got him as a small puppy, which has been a blessing for helping his training progress by leaps and bounds. I got him when he was only six weeks old. As a puppy being raised to be a working assistance dog, I needed to carefully control the environment during specific periods of his development when puppies are most prone to fear periods. I do *not* recommend taking a puppy away from its mother and litter before it is ten weeks old, and you should really wait until twelve weeks old. This time is critical for the puppy to learn how to properly interact with the mother and littermates to be well socialized ( to act like a normal dog with other dogs, and even people) and is also the time they learn bite inhibition from their siblings. I only decided to get Journey sooner because I am experienced with canine behavior and know how to overcome any problems puppies might normally have when taken too early. I also had the benefit of a gentle and well balanced adult dog in the form of Ember, who helped tremendously with teaching Journey things only another dog could. I owe most of his early socialization to her and her tremendous good nature and patience. Not all adult dogs are as accepting or tolerating. Please keep this in mind when you choose to bring a new puppy into your home. In the first week, Journey already knew basic commands and was walking well on a leash. From day one he has been a little sponge, quickly absorbing training we worked on together. His training quickly progressed and he qualified as an AKC STAR Puppy ( puppy version of Canine Good Citizen ) sooner than puppies twice his age. We continued with his training and have spent many hours working on obedience and public access. Everywhere we go, we get nothing but compliments about how well behaved he is for such a young dog. There have been plenty of times people thought he was an adult because he is so big, and upon me explaining he was still a puppy, they were amazed. Now almost a year later, Journey is nearly ready to officially go through the Canine Good Citizen testing. I have done several mock versions of the testing criteria for practice, and he has aced it. Same thing with public access testing criteria, giving mock tests as we have been training and he has passed with flying colors. Journey currently preforms his primary task of retrieving dropped items on the first ask 95% of the time, in any public setting, which is phenominal for a pup his age. He does well with his balance and bracing task training, though he is still learning how to best position his body. I have to wait until his growth plates close before we can do any intensive full weight bearing work, but what he is able to do now, he does very well. We will continue to record our progress together as a working team, so please keep checking back for future updates and content. You can currently find some of this information regularly posted in my online journals and on social media sites like Facebook. "Why do you have an assistance dog?" I get that question a lot, because physically on the outside I look normal. I have some health issues that have made things difficult for me. I have Dysautonomia, my own resulting in neurally mediated hypotension and related problems that often cause balance issues. When I have symptoms, trying to constantly compensate and correct my posture to keep from stumbling or falling can be very physically draining on top of the constant widespread pain and fatigue I experience due to Fibromyalgia. I was once nervous to go anywhere without my significant other or a friend in case I had an episode that led to full syncope ( passing out ) and falling. My service dogs have allowed me to be more independent again. With their help, I don't expend as much energy keeping balance. I can do more and stay out longer than I used to before I had their help. Training is not over simply because we get our certifications. Training and learning keeps going, long beyond that. There is always room for improvement, and always room to learn new and exciting things! It takes a metric ton of patience, dedication, and repetition to just get to the beginning foundation of what is really required to train your own assistance dog. If you have come across this writing by searching for information on owner-training, it is not an easy process and not one to be taken lightly. I have spent countless hours reading, watching videos, and having hands on experience to prepare for all this, and we have hardly scratched the surface. That being said, don't let it discourage you if you are really serious about it and can truly benefit from such an amazing partnership. Please feel free to contact me with any questions. I'm happy to help if I can.